Healthy feeding is not only necessary for humans but also for pets. As a pet owner, you will often want to prepare a proper barf diet for your pets. A good barf diet has several constituents, but ground bones are essential ingredients that should not be neglected. 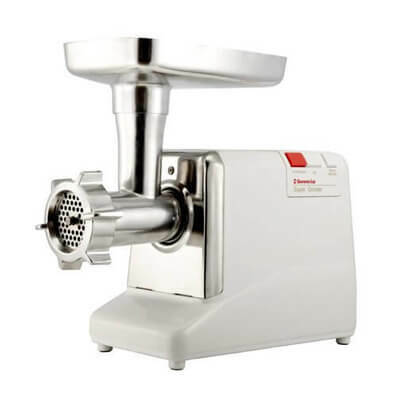 Not every meat grinder can be used in grinding bones. 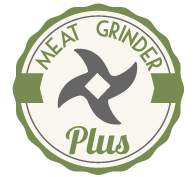 It might be necessary for pet owners who want the best for their pets to invest in suitable grinders that can grind meats as well as bones. 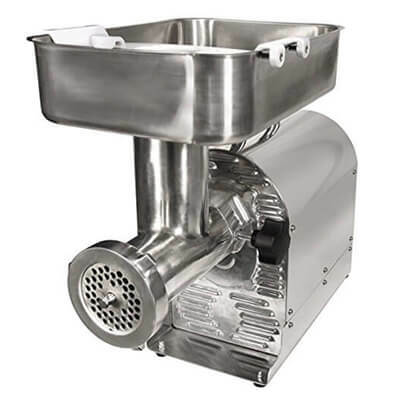 However, the question is: given various options, which meat grinder would you choose and what are the distinguishing features of the meat grinders? Following a detailed analysis on top meat grinders, here are options that will help you grind bones for your pet’s barf diets. This grinder is powerful for making raw food for your pet. The operation is very fast and would take half the time used by most grinders. Despite being costly, it is worth it. From raw small bones to partially frozen meat, you can also use it for grinding rabbit, chicken, turkey and even soft pork rib bones without jamming it. Built-in circuit breaker to prevent damages to the motor in case of power outages or surges. This powerful grinder is not only great for home use but also wonderful for commercial purposes. Being a size #32with a wider feeding tray and a high motor speed, you can process large amounts of meat within a short period of time. You can grind any type of meat, the toughest of tendons and bones though very dense animal bones would jam the grinder and even damage it. If you’re looking for a grinder more than capable of handling bones tendons and meat without clogging up, then this will be your perfect companion. It is ideal for home use because it might not be able to handle a very large amount of meat for commercial use in restaurants or any other related place. 0.75 horsepower induction motor with 110V and 550 Watts, capable of grinding with speed of 11 pounds per minute. No need of slicing your meat into smaller chunks since the Big Bite Technology will do that for you. Being a size 12, you can operate with a moderately large quantity of meat or bones. However, the model has about 5 different options for you to pick from in case you need a larger size #32 with more horsepower of up to 1.5 HP or smaller size #8 with the least horsepower. You no longer have to seek the services of your local butcher in order to get some nice ground meat nor purchase sausages at the supermarket. This electric size #12 grinder is what you need for grinding even the toughest of meats and making special sausages or Kubbe. The STX-1800-Magnum grinder is ideal for home use especially with large families though it can also make a difference in commercial places. Since it is a size #12 with 2” feeding tube, you can feed in large amounts of meat or bones with much ease. If you want the grinder to last longer, you only need to grind soft bones, including chicken, rabbit or turkey bones. This heavy duty grinder has big gears and gearbox which makes it able to withstand the pressure of grinding bones and tough tendons. It is great for making raw dog food, sausages and also partially frozen meat for your own consumption. 3 stainless steel cutting plates for fine, medium or coarse grinding. Lightweight and would take up much less of your space. 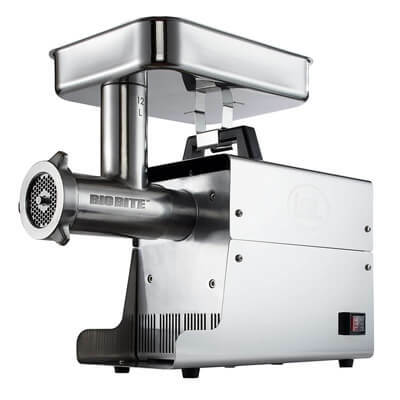 The Sunmile SM-G50 is very great for home use whereby grinding is not very often. Though it is heavy duty, it loses efficiency with regular use. You’ll, therefore, be required to find another if you grind daily. Having been designed with stainless steel plates, blades, gearbox and a detachable aluminum tube, the grinder is meant to be durable. Additionally, it has 3 control switches: on/off, circuit breaker and a reverse switch for reversing the chunks in case of a jam. 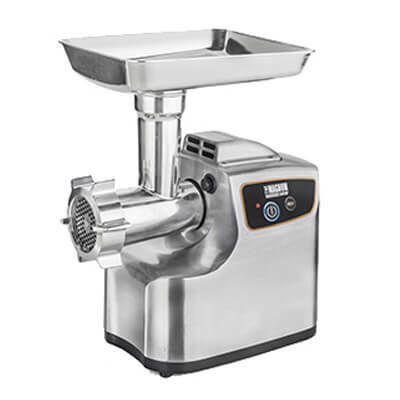 The Kitchener #8 0.5 horsepower electric grinder is an affordable heavy-duty meat grinder with the power to handle most processing needs. This grinder is designed to process the toughest meat. The powerful 0.5 HP motor enables the grinder to handle small, soft bones. 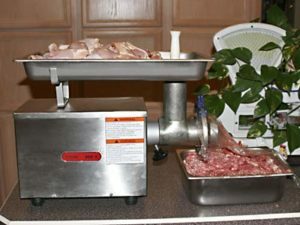 You can use the grinder to grind all kinds of game meat. It can handle 5 to 8 pounds of meat per minute. This means you can process up to 480 pounds of meat in an hour. The grinding plates and cutting knife are made of stainless steel. It comes with durable stainless steel plates and knife. This is a great entry-level heavy duty grinder for an affordable price. The Kitchener products #8 grinder is easy to use, powerful enough for your bone grinding needs and looks great on most countertops. The following bones are the easiest to grind: fish, poultry, rabbit & rodent bones are all okay, especially the chicken wing tips, the ribcage, necks, and backs. Do not attempt to grind up leg bones or anything larger or thicker than your thumb – these may prove to be too difficult for the grinder, and while perhaps gnawed on, the actual bone would not likely be consumed by a cat, anyway (too large & coarse). Run the bones through a meat grinder twice, using a finer plate the second time. If you need them like saw-dust, ask a local butcher for further recommendations. Marrow, blood, and other tissue will be present in some bone. This is all right and healthy for the animal to consume. Never feed cooked bones of any kind to an animal. Raw bones are completely fine to feed – even ground, smashed, and cut – but cooked bones are tough and hard and are prone to splinter and can cause serious injury. Only feed bones in a 5-10% ratio of the entire meal. Not a lot of bone is needed in an animal’s diet, but it is a critical part. Feeding too much bone can cause constipation, white & chalky stools, and impaction. If your pet refuses to eat ground bone, you can try feeding bone meal (bought from health food stores) as a substitute, or ground eggshells (1/2 teaspoon per pound of meat), or calcium supplement. Rather than depending on processed dog meal throughout the week, you can prepare a special barf diet which contains calcium and proteinaceous living enzymes, beneficial for your pet’s body function. Some people are ever cautious to the extent that they won’t feed their dogs on bones, simply because they believe it might lead to splinters or choking. However, this should not be the case since you can still grind those bones on your meat grinder and serve your dog or cat. What you need to know is that you can still spend less by purchasing a manual grinder, like LEM #10 and process those soft bones for your pet. However, investing in an electric grinder with high wattage and motor speed would not only process larger amounts of bones and save your time but also reduce the efforts you would have used when operating a hand-powered grinder. Check Our TOP 5 Picks!